Have you ever wanted to talk to Ernest Hemingway? Just wanted to sit down at a table in some Paris bistro and ask him when he knew that Jake Barnes belonged to him, was his totally and absolutely. When THE SUN ALSO RISES was his book to write and that nobody else was meant to do it? Have you ever wanted to look into Hemingway’s eyes, just look into his eyes while he was talking about Barnes the way he might talk about his nightmares or his best fantasies? Have you ever wanted to talk to John Steinbeck? Have you ever wanted to ask him about when he realized that Tom Joad wasn’t just any Okie? Have you ever wanted to ask Steinbeck when he knew that Tom Joad was becoming enormous inside the words, that Tom Joad was starting to have veins and arteries and was actually dreaming on his own? And, maybe you were sitting with Steinbeck in an old shot and beer saloon and Steinbeck was just starting on his third round and he was talking about how Joad would sit down with him and start telling him parts of the book as though they were stories Joad had heard in prison or from other drifters, america’s famously and infamously dispossessed, and the more that Steinbeck talked the more that Tom Joad talked and was really coming into the miracle of his voice. And, when Steinbeck finally put THE GRAPES OF WRATH out on the table, there was a bloody fingerprint just above the word WRATH on the book jacket. Have you ever wanted to sit down with Faulkner in Musso and Frank’s in Los Angeles and have a ham on rye and a tall cold beer while Faulkner talked about THE BEAR. He wasn’t eating, just talking and occasionally doing a shot. And, he wasn’t talking about the people in the story. Instead, he was just concentrating on Old Ben, the bear. He was telling about the day he thought of Old Ben and just the idea of that animal gave him fever chills and goose bumps and he couldn’t wait to sit down and start writing. And, while Faulkner told about Old Ben, his voice went hauntingly low and his eyes got that southern, victoriously defeated look about them, and pretty soon his talking made my sandwich and my beer taste so much better. Have you ever wanted to meet Cormac McCarthy accidentally in an Albuquerque restaurant way up in the heights. McCarthy thinks nobody knows who he is. But, he is wrong, I know him, or at least what he looks like. He is talking to maybe an agent or a Hollywood producer. Who knows, the man looks like some kind of big shot. But, that doesn’t matter. What does matter is the way that McCarthy is talking. He’s gesturing and is very animated and excited about something. Maybe he’s telling about how Chigurh, the killer of NO COUNTRY FOR OLD MEN, came to him. Maybe it was a nightmare. Maybe it was a newspaper story. Or, he might be talking about Judge Holden, BLOOD MERIDIAN, the novel that he will never be able to shake from his memory and dreams. I am sitting half a room away, can’t hear the conversation, but in a peculiar way am almost a part of it. I’ve wanted to ask him about Judge Holden. I would love to spend five minutes with McCarthy about Holden or even Chigurh. But it is a part of McCarthy’s personal code, he despises strangers who approach him for autographs or questions. So, I respect that code. But, I know there is something I can do. When his friend gets up for a coffee refill, I decided to leave by the exit door which is located just behind McCarthy. To do that I need to approach his table and walk around it to reach the exit. What I am interested in is not so much conversation. I just want to look into his eyes. I just want to see what his eyes are like. And, I want to play a kind of psychic chickie run just to see who will blink first. I want to see what his reaction will be like when I look like I am heading straight for him. So, now I am on my feet. McCarthy is looking down at the table at nothing in particular, dirty plates, soiled napkins. This takes up a second or so. When he glances up, I am walking in a straight line toward him. He is aware of it now. He still has a calm expression on his face but that changes in the next second or two. Suddenly, he begins to shift around in his chair, but just slightly. Maybe he’s looking for a place to escape to. Maybe he doesn’t want to make eye contact. Now I am just a few feet from his table. He has stopped shifting around and he is staring straight at me, but it isn’t a friendly look. I can sense some anger in it, maybe some rage. And, it is now occurring to me that maybe I would be looking this way if the situation were reversed. Maybe I’d be pissed off, too. But now I am in this thing right to the end. And, I need to really look into his eyes. I need to see them up close and personal, as though this is some kind of psychic combat. I notice that McCarthy has tensed himself. It looks as though he might stand up. I am sliding around his table and his face has flushed and he looks as though he might stand up. Now, I am on the other side of the table walking past him and I can just barely see him watching me out of the corner of his eye and then it is over and I am going out the door. I never did see Judge Holden in that stare. Or Chigurh. Or anyone else from his novels. And, maybe I didn’t want to or need to. A signed book is useless, an artifact, an object that may or may not be worth money. But it does nothing to conjure that writer’s characters or dreams. The fact is that I didn’t discover a thing from that encounter. Nothing, nada. Except the primal fear of a famous man who seriously wants to be left alone. And, in that moment I also realized that it would do no good to talk to Hemingway, to Steinbeck, to Faulkner either. That Jake Barnes and Tom Joad and Judge Holden and Chigurh don’t really live in that blood anymore. Even though I was hoping against hope that they could. Later, in a coffeehouse halfway across town, I sat thinking about what had just happened. Dillinger was sitting across from me. 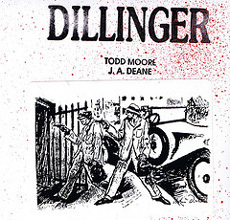 Or, lets just say that I imagined Dillinger sitting across from me maybe the way that McCarthy might privately conjure Holden or that Melville in the depths of his depression would conjure Ahab. Dillinger didn’t say anything, he just sat there and let me have my silence. And, that’s when I realized that a character like Judge Holden or Huck Finn or Jay Gatsby or Dillinger become more than just someone found in a book. You can’t own Ahab. Melville cobbled him out of flensing blades and harpoons him but he couldn’t own him. You can’t own Joseph K. Kafka put him together with blood angst and longing but he couldn’t own him. You can’t own Moosbrugger. Robert Musil hammered him out of knife blades and hatchets but you can’t own him. And you can’t own Chinaski. Bukowski found him among the beer rags and racing forms but you can’t own him. Somehow the memorable, the great characters all slip their moorings and become free. The critics would like to think that they own them, but that won’t happen even on their best days. Bloom could never own Hamlet, no matter how many theories that he devises. Hamlet will always have a dream tie to Shakespeare who can’t really own him either. The great characters are very much like great outlaws. They step outside the bounds. They belong to no one except maybe an archetypal wind. They are the sum totals of their books and then they become the world as well. Nights Dillinger comes and goes. I hear him enter, then leave the house. He carries the dream machine gun I gave him. I know he drives out into the desert looking for something. Maybe it is the next section of the poem that he’s in. Or, maybe it’s the blood rich darkness of an america longing for the black pour, the expectation of love and disaster. 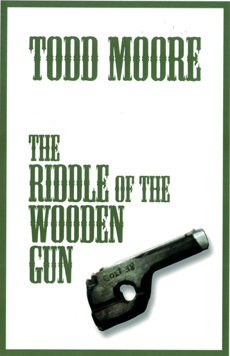 Outstanding essay by Todd Moore. I love the way the essay shifts gears in the middle, and ends with an evocative flourish. I love the way Todd Moore mounts intensity on top of intensity. This essay builds and builds and erupts and erupts.